There is a lot of fuss on ‘failure’ and “leadership capacity” of Mising self-government movement. Although it might be accepted that there is a partial leadership failure the absolute claim of being a failed movement can be countered on the mobilization the organization. There is a relevance of behavioural pattern that Mising movement has to do with democratic values. The way the autonomy movement is going through could be dubbed as “Miri/Mising Model” in near if the state responses are inclined to the unique nature of movement. The peaceful mobilization of Mising people could help in deepening democracy among ethnic communities. Mising autonomy movement can be traced to May 20, 1947 when resolutions were adopted in Murkongselek with a British political officer, Howard William in the chair on May 20, 1947. This was undertaken North East Frontier Miri Abor Sanmilan (NEFMAS). One of the resolutions was to create an autonomous unit with specific boundary in all Tani tribes inhabited areas of Brahmaputra valley to Tibet border. It was decided that neighboring indigenous communities would be treated as minorities with right to vote and citizenship. Provisions for creation of legislative council with elected representatives, collections of revenues, land entitlement and transfers were discussed and firm resolutions for a unit of self-government were adopted. 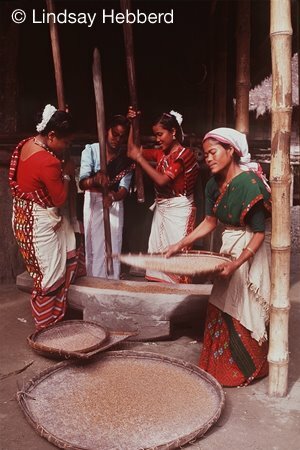 The resolutions were agreed upon by Abor, Miri, Dafla, and Charak tribes on the ground that there was“uniformity in language, culture, religion and manners” (Ranoj Pegu, 1997). In successive years of post-colonial India, like many other ethnic indigenous peoples Mising people moderately joined the echoes of deprivation and injustice against hegemonic project. 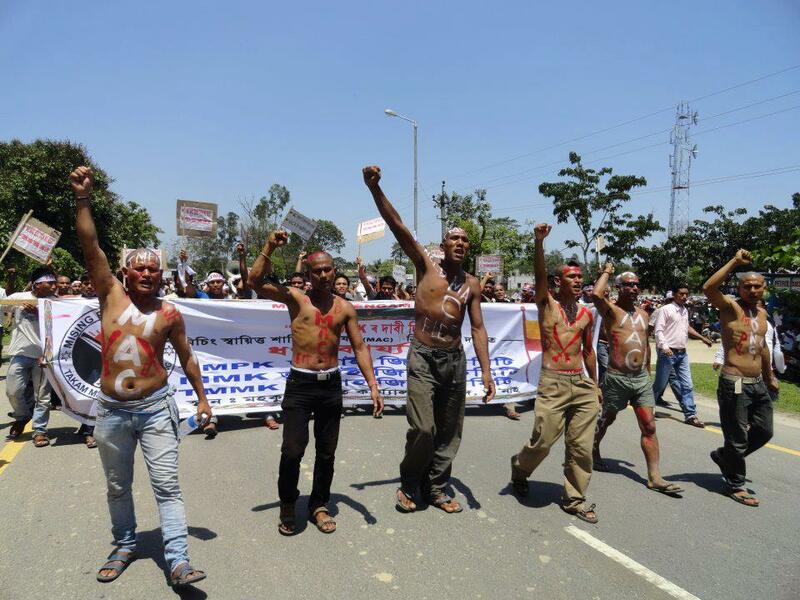 The sporadic participation in the movement of Udayachal homeland demand for plain tribes in Assam led by the Plain Tribes Council of Assam (PTCA) bears testimony. Misings’ literary society, Mising Agom Kébang (MAK), formed in 1972 brought about national consciousness especially in language and culture at the height of contentious language policy of Assam. All Assam Miri High School located in Matmora, now known for iconic geotube dyke to prevent flood disasters, is a spot known for where the autonomy demand reignited. It was formally announced in a conference in 1981, Takam Mising Porin Kébang (TMPK), translated as All Mising Students’ Union, one of the oldest Mising organizations, that Mising people would seek self-government as per Constitutional basis, the Sixth Schedule. It was at the height of anti-foreigners movement in Assam; Misings’ clamour was left unheard in the din of ethnic movements and secessionist uprisings. Two decades later, the government reach a settlement with Bodo nationalists, the previously ‘inapplicable’laws was amended as a conflict-resolution measure with one of the largest indigenous tribes of the region. Student organizations have been increasingly taking a central role in the social and political life of indigenous communities. The student organization representing Misings, the Takam Mising Porin Kébang (TMPK), helms the movement for self-government since last three decades. Transition from older to younger leadership brought about new dimensions to the movement. The Mising mobilization for autonomy movement has been perpetually by the student organization and allied organizations. The interplay of social, political and economic elites in the movement has manipulated its course. The instance of government announcement of Mising Autonomous Council (MAC) in April 1995 with support from few ruling political class workers gave away ‘selective’ incentives without a determinate territory underpinned the scope for intra-ethnic conflict. The immediate response with mass mobilization by nationalist organizations was repressed. In the following years, Mising movement has seen several ups and downs as necessitated by the state’s political climate. Creation of territorial council in 2003 comprising Bodos and several indigenous communities in the state affected the subsequent political agenda adopted by the community’s leadership. General elections and state assembly polls held in post-Bodo accord (2003) also influenced ethnic nationalism. Renewed mobilization for autonomy around 2003-2004 under Mising, Rabha and Tiwa nationalist organizations forced the state government to form cabinet committee. Meanwhile in June 2004, the committee green lighted to delicately look at ethnic autonomy. When they were supposed to be in Gogamukh , the head quarter of Mising Autonomous Council (MAC), to study the feasibility of autonomy thousands welcome the move. However, supporters suffered attacks from other groups en route the venue. The concerns of Misings cohabiters’ communities were land security issues and property, coupled political gains. Consequently, there were disturbances among different communities in several districts in Upper Assam inhabited by Mising ethnic groups. It created a divide between pro-Mising and non-Mising within days. There was also media and organized campaigns questioning Mising indigeneity and validity of autonomy demand. Observers anticipated ethnic violence in subsequent days. Contrarily, Mising nationalists called for measures to bridging gaps between people. Leaders from other communities were invited to spread the message of democratic agitation and public solidarity. It was told touted a “development mechanism” to bring people out from under development and socio-economic problems. This led to induction of members of various communities in the Mising Autonomous Council (MAC) when nationalist organizations accepted to rule the Gogamukh headquarter offices after minor amendment in the MAC Act, 1995. Since then, the movement plummeted into dialogues to resolve differences and expressing solidarity to democratic voices. Despite Election Commission’s recommendation of the Sisiborgaon assembly constituency in Dhemaji district’s reservation for STs, Mising nationalist organizations joined voices with non-ST communities to press for the proposed constituency’s opening out for all communities. Many argue that granting autonomy to indigenous people will lead to further divisions of society and fuel violent ethnic separatism. However, Mising mobilization contradicts the view since there is a continuous effort towards building consensus and confidence among communities. If the leadership did not handle it well, the situation post-June 2004, there was much possibility of aggravating strife. As of now, ethnic Mising people might have been seated in “cauldron of violence” like other in NE areas. From anti-big dam movements to flood security and erosions agitation in Northeast, Mising organizations have joined hands with peasants’ organizations and various other organizations to lend a united voice. Mising habitats are among the most vulnerable to big dams, floods and erosion. Mising people’s mobilization for autonomy must be understood in the current political backdrop; it has adapted to conciliatory and confidence building measures. The Mising nationalists are pursuing a new type of politics for marginalized people that are directed towards strengthening local level democracy in areas dominated by ethnic minorities. Their remarkable democratic movement, if accorded a political space, could have much contemporary relevance and help dismiss the notion of militant armed movement to get heard by the state. Even amidst hostility, one of the largest ethnic indigenous communities’ leadership in North East has been adopting conciliatory means by subscribing to democratization, tolerance, peace and stability; this is undoubtedly a unique example. Ali-Aye Ligang, meaning and message.